I know exercise is good for me. But it is a real battle. I take my iPod with me and use my time to praise God but even that is hard when you are doing leg presses or squats and are out of breath. I can praise Him that I have legs that work and lungs that are clear. I know all of that but I still find it difficult to “enjoy” exercise. It is not my first choice. I think my travel interrupts any routine I establish. But is that an excuse? Maybe someone out there has some suggestions. I know there are exercises I can do with bands in a hotel room. I know I can pack my sneakers and go to the hotel’s gym but the sneakers take up so much suitcase room as I try to carry my luggage with me for fear of lost luggage. Most disciplines in life are hard. We prefer to indulge ourselves. Take a nap. Watch a TV program. Eat that last piece of pie. Chat with a friend rather than spend time praying. None of that is wrong – God gave us all things richly to enjoy (I Timothy 6:17). It’s the balance I find hard. I suppose balance is one of the most important elements in life. To balance leisure with work. To balance family with ministry. To balance faith with works. To balance exercise with rest. Our culture tells us we can have it all. But somewhere something gets lost. We can lose perspective. Become brittle and harsh or soft and self-indulgent. I don’t want to be either. I have been a number of places recently including California to speak to the President’s Forum weekend for Partners International. It is a wonderful organization that finds out where God is at work in the hardest to reach places around the world and supports the indigenous ministries. I loved learning about them, meeting their folks and hearing about the ministry they have around the world. The people I met are not into “kingdom building” for themselves but are humble, sweet people with servant hearts. Jon Lewis, the president, is a dear man. I loved being with them. You might want to peek at their website: partnersintl.org to learn more. It is a very worthwhile, faithful organization. I commend it to you. I plan to use their catalogue to give gifts this Christmas. Instead of giving my grandchildren things they do not need I plan to give them a Partners International catalogue with a $25.00 check made out to Partners International so that they can sit down and choose a gift for someone else. Last weekend my husband, his 3 sons and my grandson (all about the same age) returned to Angola Prison to attend the rodeo and minister to the prisoner-pastors and interns as well as the wardens and those attending the on-site Bible college. We were so blessed. The boys were amazed that men convicted of such heinous crimes were kind, full of joy and peace – a testimony of God’s grace and redemption. There are 5200 inmates – all there for life sentences. It used to be the most notorious prison in America – certainly the most bloody. But God, through Warden Burl Cain, has turned that place around. It is a wonderful experience to be there and meet the men. We stayed on campus – there are 18,000 acres, surrounded on 3 sides by the Mississippi River. We never felt that we were at a maximum security prison unless we looked at the rolls of razor wire. There is no graffiti, no swearing, no cat calls – just a lot of respect and peace. That doesn’t discount the sadness and struggle these men experience for the victims of their crimes and their own families. They have loneliness and fears and needs – like all of us. But they are rebuilding their lives in a way that will bring glory to God. We came away, as we did before, with a profound respect for the chaplains that minister day in and day out. As we were accompanied by the head chaplain, Robert Toney, we saw the respect and love they have for him. It is a remarkable place. These same prisoners built my mother’s coffin and have built my father’s: a plain plywood box lined with a mattress pad – the same that they use to bury the inmates who die in prison. If you don’t know about Angola Prison, read Cain’s Redemption. It is the story of Angola Prison. I am home for a few days and will enjoy getting back into the yard to “winterize” it. I am having the joy – and responsibility – of doing many interviews to promote my book, Fear Not Tomorrow, God Is Already There. I love talking to folks all around the country – these are radio interviews I can do by phone from home. By the way, the companion devotional book will be out by Christmas. It is the same title but called “The Devotional Book”. I wrote it for myself as much as anyone else as I was facing uncertainty in my own life. So, if the book is nothing else it is authentic! For fun…did you know that grasshoppers have white blood? Butterflies taste with their hind feet and have about 4000 muscles? An armadillo can walk underwater? (The boys saw an armadillo for the first time while we were at Angola.) And minnows have teeth in their throats? Just a bit of trivia I gleaned form Jodi Picoult’s book, Handle With Care. She is one of the authors I read when I travel! I am in Dallas and have done a full day of media to promote my new book. I was up at 5:00 AM to be on a local morning show. One question that I am invariably asked is. “What was it like to grow up in the home of Billy Graham?” There are times that frustrates me. It may seem odd but I am never quite sure what they mean by that or what they may expect the answer to be. My growing up was probably the same as growing up in your home. It was normal for me as yours was for you! Your father may have been a plumber, pastor, business man, doctor…but he was your dad. My father was a preacher who traveled. Because we grew up in a small community populated by retired missionaries and pastors it was not unusual for people to have traveled the globe preaching. So what daddy did seemed fairly normal. We were very proud of him but my parents did not raise us to think of ourselves as special. We were different, not special. They never expected us to live up to some false expectations or live our lives to reflect well on them. Over and over they told us that we represented the Lord Jesus and to live in a way that would honor Him. There were times I worked hard to meet other people’s expectations – I wore myself out. And people still weren’t happy! I felt that so many people were watching and that I was a disappointment because of my failures and sins. I still work at letting that go and living to please Jesus only. I know have an audience of One! It’s taken a while and I am still not there but I am a work in process. Being Billy Graham’s daughter is part of what I am – not who I am. I am a sinner saved by grace. http://ruthgraham.com/wp-content/uploads/2016/12/ruth-graham-logo.png 0 0 Ruth Graham http://ruthgraham.com/wp-content/uploads/2016/12/ruth-graham-logo.png Ruth Graham2009-10-23 15:44:592017-01-31 18:52:43What was it like...? Yesterday was another beautiful fall day here in Virgina – as is today. October is known for it’s “bright blue weather”. It was good to get in the yard and clean up after summer’s ostentatious bounty. While I have been traveling the deer have had a smorgasbord in my garden – astilbe, tomatoes, sweet potato vine, hydrangea…I hope they got indigestion! I have a very effective spray that my husband orders online: Deer Off. It works well if you are home to spray it! It is all natural and based on mint so it doesn’t stink! I recommend it. However, back to my yard… it had begun to look messy and needed some freshening up. So I pulled weeds, trimmed things back, turned the soil, threw some plants away that had passed their peak. At one point my wagon was so full and heavy it got away from me running down hill and burst through the board fence! There are many illustrations of our Christian life that we can pull (no pun intended) from the gardening analogy and I do that in our Ruth Graham & Friends “Get Growing” conferences but I don’t feel like that today. It can be overdone. I just enjoyed getting in the yard. I find it a stress-reliever. And had I time to go by a garden center to pick up a big beautiful mum and other winter hardy plants to replace the things I had to toss. I found various sizes of pumpkins and gourds to stand guard outside my front door. So…now things are looking fallish around here. I feel satisfied. I also had time to run by a nearby Christian radio station that was having it’s annual share-a-thon. I think Christian radio is important – especially in these times – and I think we need to support it. It is a voice that needs to continue and it can only continue if we give. We are living in an increasingly secular society we need strong voices proclaiming the Christian world view. I donated a copy of all my books, including the just released, Fear Not Tomorrow, God Is Already There, for them to offer as an incentive for listeners to give. So from my yard and pumpkins to Christian radio…and a special birthday dinner for my husband with good conversation. A full, satisfying day. God is good! It is a beautiful day here in Virginia. We had much needed rain overnight and now the world is sparkling! Yesterday was a day full of the mundane things that make up life – doctor visit, flu shot, grocery shopping, desk work, making dinner, helping with homework…I am blessed to have a husband that does all the laundry so that is one chore I do not have to do. And he does a much better job than I do! I like these breathers between trips – I am a homebody and like the routine of home. It keeps me grounded. And, for me, often God speaks in the mundane. I don’t often have great insights that come to me in times of deep prayer or spiritual discipline. No visions or ephanies – just insights that come in the routine and mundane. I have discovered that in showing up, being faithful in the routine makes it holy. My mother had a old Scottish saying that still hangs over her kitchen sink, “Divine Services Conducted Here Three Times Daily.” We can make our rountines and the mundane things of life divine by choosing to do it unto Him. I am home and it is a beautiful day. It is a day to go get some exercise, do laundry, go to the grocery store and get sorted out after so many days “on the road”. I am trying to come down with a cold and can never remember if it is “starve a cold and feed a fever” or the other way around! My mother believed in lots of Vitamin C. This morning I was reading Psalm 135 and it is a wonderful reminder of just who God is and what He has done for us. 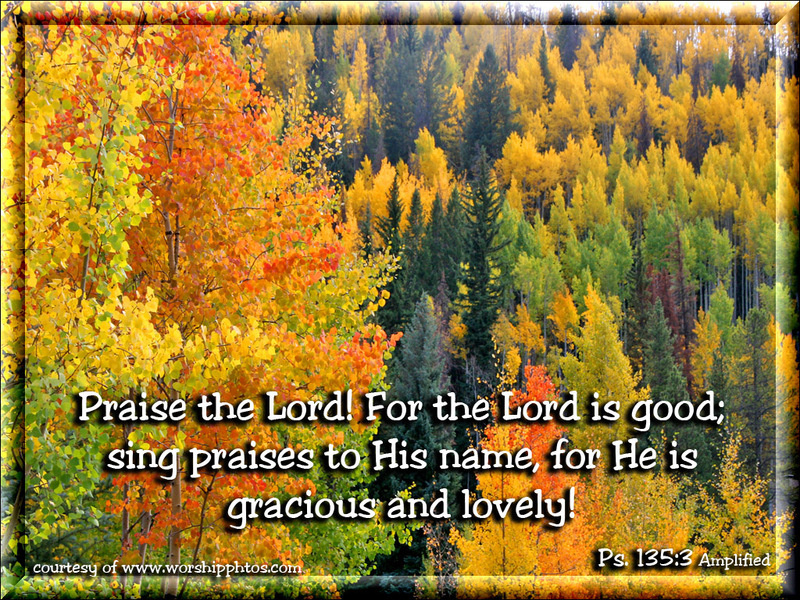 Our response is to praise Him. I suggest taking a moment to just praise Him for who he is. Use this Psalm: He is good. His name is pleasant. He has chosen us to be His treasured possession. He is great, greater than any other gods. 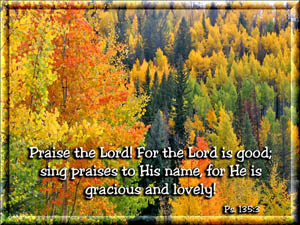 Read the Psalm for yourself and find things for which to praise our marvelous God. You may not feel like praise but try it and see if your mindset changes. He will bless your efforts. If you like to use screen savers on your computer, I would love to share this graphic with you. This image is from Jim and Mary Whitmer who work with me in the “Get Growing” conferences. Just click on this image and a full-sized image will download to your computer, and then you can right click on it to save it. Enjoy. We, my sister Gigi is with me, had a great day yesterday. We had several interviews at KTIS talking about the legacy of my father here at Northwestern College. He had a vision 60 years ago to use media to reach people with the gospel – at that time the media was radio. The vision he had has been carried forward and they have expanded to using all sorts of medium to proclaim the gospel. My father’s legacy lives on! We all have a legacy and we get to choose what it will be. Will it be one of faith? Love? Joy? Anger? Bitterness? Good morning! I am now in St Paul, MN to help clebrate the 60th anniversary of radio station KTIS. It was founded by my father while he was president of Norhwestern College He was the youngest college president in the US at that time. My sister Gigi and I are representing the family. But it was so dear to hear his voice. I asked if he had seen me on Fox and Freinds that morning. He said no but had heard about it. I hope to get down to see him in the next couple of weeks. I miss him. He is so dear. It is a six hour drive from my home so it isn’t an easy, quick drive . This has been a busy week. But I an grateful for the opportunites God gave for me to talk about the book. After one interview, I was walking back to my hotel and was near Times Square. From the shadow of a stairwell I heard a woman preachng the Gospel. I walked passed but then stopped. I felt that I should stop and speak to her and encourage her. I also had a remaining copy of my book and decided to give it to her. I did not introduce myself as “Billy Graham’s daughter” but just thanked her for doing what she was doing – being a light in that dark place. I gave her the copy of my book and she glanced at it and made the connection. Her name was Brenda and her husband was Solomon. She told me she had met my father years ago in Central Park. We had our pictures taken together. It was just a short encounter but it made my day! Who will you encounter today to give a word of encouragement or cheer only to find that you are the one to get a blessing? As I write my first post I am in Toronto, Canada to help dedicate the new women’s center for Teen Challenge – a residential facility for recovery from substance abuse. Teen Challenge, started by David Wilkerson in NYC, has a long history of success with men – after 5 years there is a 70% success rate. Huge! I am thrilled they now have a place for women and am honored that they have asked me to participate in this special occasion. This morning I was on 100 Huntley Place television show – the Canadian 700 Club. Moira Brown interviewed me and I had a good opportunity to talk about my new book, Fear Not Tomorrow, God Is Already There, the ministry of Ruth Graham & Friends and our time at Angola Prison in Louisiana. Click on the Angola Photographs link under the “Important Links” section of my blog if you would like to view a few of some wonderful photographs and video done by Jim Whitmer while we were there. It was a profound experience. http://ruthgraham.com/wp-content/uploads/2016/12/ruth-graham-logo.png 0 0 Ruth Graham http://ruthgraham.com/wp-content/uploads/2016/12/ruth-graham-logo.png Ruth Graham2009-09-23 16:08:282017-01-31 18:52:43Hello!